Recently, legislation around stormwater management and industry trends have rapidly affected stormwater infrastructure and guidelines for implementing a stormwater management system. Existing stormwater management systems are sometimes outdated, overtaxed or designed to outdated codes. Often, there’s a scarcity of useable land in urban areas and safety issues to consider. Now, more than ever, urban sites need to manage stormwater runoff, collection and release in a more viable way. Without a proper stormwater management system in place, businesses could face damage to their infrastructure, costly repairs or even devastating fines from local and national governing bodies. Legislation, best management practices and industry trends, including Low Impact Development (LID) and sustainable drainage scheme (SUDS) are driving the need for stormwater management products that are able to fit in smaller space constraints, have reduced maintenance required and low installation costs. While covering these issues, this webinar will include a discussion about how a subsurface stormwater management system designed for surface water infiltration and storage can address concerns raised by local and national bodies. Ben has nearly 10 years’ experience supporting the design community with creative solutions to issues related to Stormwater management. His support of the design community has resulted in being invited to speak at numerous trade organization events including ASCE, AIA, and ASLA to name a few. Ben is excited to represent ACO as they have some of the most innovative Stormwater systems on the market. Kraig Smith is a Civil Engineer by trade and has a Bachelor’s of Engineering degree from the University of Bradford School of Engineering in the United Kingdom. He has worked for various engineering consultancies over the past 11 years and currently works as a Specification Sales Representative for ACO Polymer Products. He works closely with engineers and architects who are looking for technical support and product knowledge to offer the most efficient and cost effective solutions for stormwater drainage on their projects. ACO StormBrixx® is a unique and patented plastic geocellular stormwater management system with a 95% void ratio that can be used in applications across all construction environments as a standalone solution or as a part of an integrated sustainable drainage scheme. ACO StormBrixx® is ideally suited for use in any application involving large paved areas, such as courtyards & plazas, large commercial parking lots, institutional buildings, residential developments, airports & ports or military bases. ACO is driving the future of stormwater management with innovative solutions to maximize use of space while making installation easy and configurable to accommodate any site. 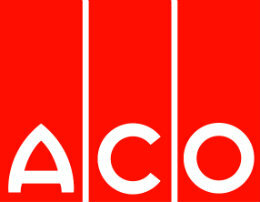 ACO Polymer Products, Inc. introduced the concept of modular trench drains to North America over 30 years ago. Today, ACO in North America is a multi-site manufacturing and sales operation using a variety of materials for its extensive range of drainage products for all aspects of building and construction. In additional to modern manufacturing facilities for its product lines, ACO offers field support for all aspects of the business – from specification advice to installation expertise. ACO is the recognized CES provider for architects and engineers on surface drainage education. As market leader, ACO USA is constantly innovating to bring new products to the market. ACO has a fully established R&D department responsible for continuous development, quality and testing to ensure ACO products continue to lead the market.